Yesterday, I saw a post that was done by my dearest friend, Tammy Dunlap. Tammy is a Christian blogger and she dispenses inspiration and what she calls “sonshine” on grandmamarymartha.blogspot.com. Her post addressed ways we can deal with writer’s block and I found it full of helpful tips. The article was titled Eight Great Points to Ponder When the Writer’s Well has Run Dry. From it, I got the inspiration to do a similar post, this time an assemblage of areas Christian bloggers can draw topics from. These have been presented as ideas, not topics. As a result, each number below can yield a wide range of topics. I’ve tried to suggest some of such topics for each idea but that is just like scratching the surface. Some bloggers have built their niche against just one of these ideas and still have a lot to share after going at it for many years. 1. God: His names, nature/personality, ability, promises, commands. This can include Jesus (His names, earthly ministry, crucifixion, resurrection and ascension) plus the Holy Spirit (His names and ministry). Christian festivals like Christmas and Easter fall here. 3. Testimonies: stories of God’s intervention resulting in conversion, healing, provision, etc. 4. Christian character: living out the fruit of the Spirit, ten commandments, etc. 7. The gospel: simply presenting the good news of salvation through Jesus and leading the targets through the sinner’s prayer, strategies for effective evangelism both face to face and through mediated communication (using television, radio, films, the social media, etc. ), how to minister the gospel to different groups: family members, friends, co-workers, business associates, strangers …. 12. Relationships: romantic relationships outside marriage, mentoring, relationships between siblings, friends, colleagues, etc. 13. Marriage: joys, trials, lessons from it, how to make it work, how to make it thrilling, etc. 18. Training in spititual disciplines and spiritual growth: how to study the bible, how to pray and conduct spiritual warfare, etc. 25. Career advice: Those retired from or still engaged in teaching, nursing, etc. can find a lot to share here on how to enter certain fields, how to excel in them, how to maintain one’s faith and find fulfilment on the job…. 27. Family: importance of family, family memories, traditions/activities, dysfunction, blending, dealing with the extended family, relating with in-laws, etc. 29. Product recommendations and shopping guides: for gifts, bible study and other spiritual or educational resources, cooking utensils, home care appliances, fashion and body care products, etc. 32. Fiction: flash fiction or longer pieces that address a wide variety of issues and situations like parenting, marriage, unemployment …. 33. Poetry: different kinds of poems addressing different issues of faith like God’s love, His faithfulness, worship, repentance, petitions …. 34. Crisp humour: Humour can be injected into most anything we post, but here I’m referring to snappy stuff that are funny. Examples include jokes, quotes, cartoons and memes. 35. All things blogging: how to set up blogs on different platforms, necessary plugins, training, finding one’s niche, keeping the focus on God, publicising blog posts (how to do that effectively on different social media), how best to handle feedback (positive and negative), how to grow one’s blog, how to monetize, how to juggle jobs, parenting, etc. with blogging, one’s blooging failures and triumphs, …. Dear Father in heaven, I commit my writing into Your hands. 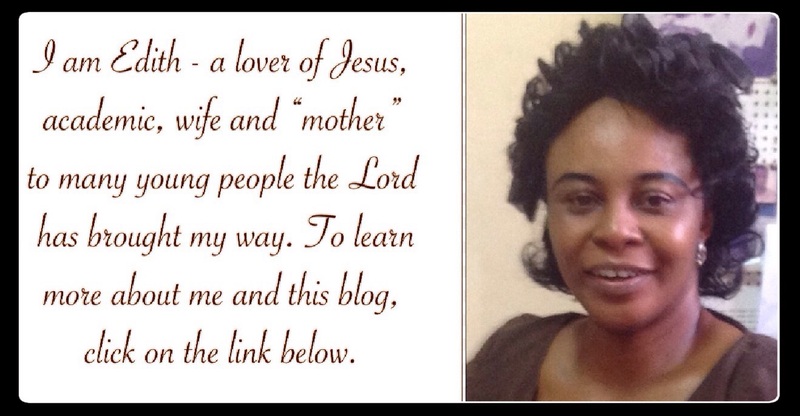 I pray that my blog will be an avenue through which people will be inspired, enlightened and uplifted via Your word. I don’t want to struggle for inspiration nor write my own thoughts. Always direct me to share what will bless my readers in Jesus’ name. Amen. I love number 2. The Bible sites many examples by giving us different stories of those who lived righteously and those who didn’t. From that, we tend not to forget what we learned since there is a person attached to it. Thanks for these tips. Glory to God! I am fascinated by human interest stories from the Bible too. When we study them under the guidance of the Holy Spirit, it's amazing the things we learn. More grace to you, dear sis, in Jesus' name. I love that you mention praying and asking for the Spirit's prompting before writing about God. My entries turn out so much better and inspired when I do this! Blessings! That's right, Christina! We are just vessels waiting to be filled and poured out. God's grace for greater fruit in your ministry in Jesus' name. Yeah! And don't forget to pray about it. Cheers! Amen. And bless you too, my dear, in Jesus' name. These tips are useful for blogging and the topics are of a wide range... Really helpful ?? Halleluia and may God bless you real good, Gloria, in Jesus' name. I am greatly blessed by your example, words, and friendship! Same here, Tammy! May the Lord keep your oil flowing in Jesus' name. And so are you, Esther! Glory to God! Lol! Pretty soon it will be all you'll be talking about. Thank you and praise God, Chidiogo! You are lifted in Jesus' name. i was really inspired, thanks ma'am for the tips. These ideas are just the best because there is nothing we can do without God. thank you Ma, am still practicing writing, and I'll adhere to your ideas. Great tips ma. Sometimes it feels like I run out of inspiration on what to write about and these are really helpful. Jotting down ASAP. Bless you ma! Encouragement for Christians#17# While going through the 35 ideas, I couldn't help but ponder really hard on dx particular point. Well done, ma. I'm really inspired by every point. Yes, if we write acvording to our own wishes, we won't make eternal impact. May your ink flow ceaselessly in Jesus' name. All these ideas are actually thought stimulating as you mentioned earlier. After going through the list, am greatly inspired to write on a variety of Christian topics... I know that great innovations come through the help of GOD, and with this great article, it shows you are greatly inspired by HIM(GOD)... Thank you Ma for this. Glory to God and more grace to you in Jesus' name. Just realized I've been missing out on so much to write about by overlooking those things right on my fingertips. Amazing ideas. Really useful ideas for writing. I love especially numbers 1, 26 and 27. Thank you so much for sharing this Aunty. God bless you and may your ink never run dry. Amen and I pray the same for you in Jesus' name. I love the one of encouraging Christians and the one of quotes, but most especially, the one of encouraging Christians because most times Christians face a lot of difficult trials and it seems like there is no way out. We need to be encouraged in the spirit, building up our hope and faith in God. Christianity isn't a bed of roses, it requires a great work. And we need all the encouragement we can get from God's word(bible).Thank you aunt Edith for this wonderful post. Such wisdom here. Thank you, my dear, and God bless you! Ummmm, I guess so. Thanks! This is really very helpful! I remember someone telling me she didn't know what to blog about. She had exhausted what she planned posting. Such a person would definitely find this helpful. This post just nailed it... God bless you ma. And bless you too, Rose! I needed to read this. Thank you Ma. You all are looking at the next Christian blogger ? Lol! Go girl, show them what you've got! The Lord's grace is with you if you really want to do this. This is so helpful, especially number 22. A Christian blogger may neglect that topic, but I'm already imagining all the good things one can write with it. Thanks very much, ma! Glad you found it useful, Chinemerem. Cheers! These tips are really helpful ma. I will also try to work on one of them. God bless you for this post. I particularly love number one and number seven. Though all are very useful. It is a whole package where one can draw wealth of knowledge from. Keep it up ma for many are being inspired. I always have difficulty in choosing the topics to write on but thanks to you, i have been exposed to so many topics with examples to help me understand. KEEP IT UP! Nice outline ma. This is quite helpful. I now have a wide range of topics to choose from when my thinking fails me. GOD BLESS YOU! This piece is really helpful. I didn't even realize that there are various things that can inspire me and bring forth wonderful topics to write about. This is really a good one, very helpful. Number two and six got me thinking. These tips are really very inspiring Ma, I have never found it necessary to limit myself to any particular topic when looking for what to write but this post have opened my eyes more to what I have been missing I love all of them but I'm particularly in love with the one about encouraging Christians, just like you said, some of us find ourselves in situations where we feel there is no way out. I've been in that situation and the good lord through his infinite goodness guided me and every morning I pray for those who have lost hope in his salvation that they see that he is the way, the truth and the light. Thank you so much ma. Now am inspired to research and write on number 31.Its something I love but have never thought of penning my ideas. Wow! There is indeed a lot one can blog on as a Christian without actually compromising their faith. It is good to know that. I think, creativity has to come in, because anybody can write on these things but the one who is creative is the one their blog gets visited frequently. Thanks a lot Ma. Christian blogging is diverse and touches every aspect of human existence. It affects the spiritual as much as it affects physical. It addresses family and relationship issues. It teaches how to be steadfast in faith to achieve what one wants. Wow.. I'm really not a writing type but this just gave me hints of interesting and stress free topics to pick from and I'm challenged to work on something soonest Thanks a lot Ma . I recently started trying my hands at writing but am always looking for what to write about. This post, I really trust, would be very useful. After going through the post, trust me, I already have a couple of things i'ld love to write about. Thanks and God bless you ma. This post is really full of ideas. People who are bereft of ideas on what to blog about can find them here in abundance. The ideas are motivating me. Aunty, You are really creative; you can generate awesome ideas. I feel like Taking up the task. Anyway Thanks Ma, for the wonderful ideas. Absolutely Awesome. Ma, this is Creativity in Action. You have dished out wonderful ideas that People can work on. Bless you, Ma. This post is wonderful. 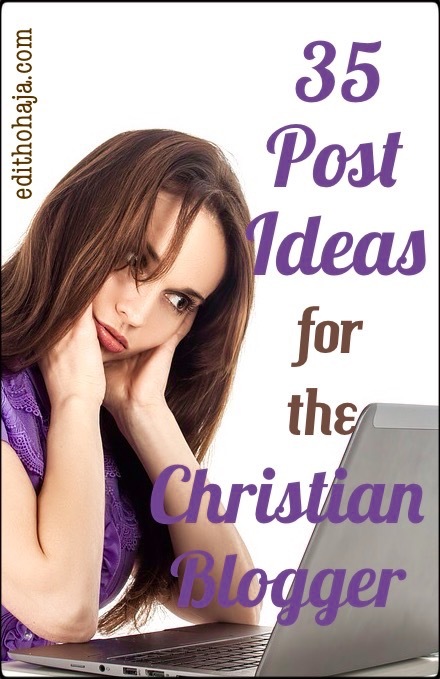 full of nice ideas that will help someone who wants to run a Christian blog. It will help in nourishing many souls. Wonderful post ma.... Now I kno dat I v missed out on so many things... Will try these tips. The topics are all good and Sensible. may God bless you ma. These 35 tips are wonderful! I commented on this post previously and I can't seem to find the comment. Nevertheless, you're doing a lot for us,aunty! This could inspire most of us to start up our own blogs and inspire everyone out there. Thank you so much ma!God bless you immensely. You're the best teacher we have ever had. The topic ideas on relationships would do the youths great good! Nice tips, I really appreciate these tips, there are inspiring and motivating for bloggers and I love number 6,14 and 15, you have to put God first in everything you do. Many things to write about; many, many things to talk about as it relates to Christianity, and their attitude towards the gospel. You can write about God, or about Christianity as a whole. You can also write about the attitude of Christians or about the different disposition about the gospel and interpretations of the word of God. You can write about anything, so long it affects the Christians behaviours. Post to the Christians. Not a bad idea I must say. I advice you pick a leaf from Apostle Paul. Pray effectively to the Holy Spirit for guidance; to aid write effectively to the Christians, and in turn to call back the lost sheep of God. You have really gone a long way, ma, in itemising such issues of importance to the Christians. Christians are really going through when it comes to their relationship with their creator, and combining their Christian lives with their taking care of their families. This post would really go a long way in providing succour to the Christians. I love no 1. God. I believe that God should be the bedrock of every christian blogger. All christian bloggers should always abide by the will of God. Lovely, I love no 17 encouraging Christians it's very important because as a Christian we need word of encouragement to move on as a Christian blogger it's necessary for you to help Christians grow more in the Lord. This is an inspiration and goes to show that as Christians, we do not have to compromise on the ways of the Lord in this world where negativity seems to flourish more than good.